As another year comes to a close, we again send you our best wishes for a happy and joyous Christmas. We only took one major trip this year to the Southwest. We all successfully passed birthdays and anniversaries. 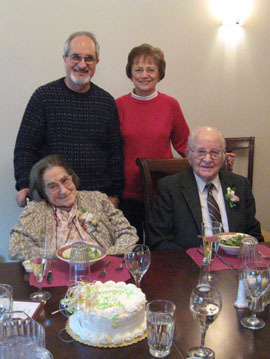 Mom & Dad celebrated their 71st Anniversary, Dad his 96th and Mom her 98th birthday. We won’t mention ours. We continue to enjoy our music ensembles. We were both thrilled to be asked to sing with Seattle Pro Musica last spring in their presentation of Mendelssohn’s Elijah. We have both been asked to sing in their March 2010 concert that will include Frank Martin’s Mass for Double Choir, Durufle’ and Poulenc Motets. We have had another busy year with our church choir and ensemble. The Ensemble has begun singing more often and their repertoire spans the centuries. Carol continues to play the piano for our enjoyment. Werner continues with his soccer business, learning new and crazy things to do with the Web. He has totally rebuilt the www.FamilyHenn.com website, adding a Blog and uploading hundreds of pictures from the present and past. Last Spring we traveled to the southwest, visiting Nevada, Utah (Zion NP), visited Werner’s cousin in Lake Havasu, our son Mark and his family in Sahuarita, AZ and Carol’s brother and family in Mesa, AZ. In July, Brian, Tyler & Alyssa came from Georgia and visited for a week. We enjoyed taking them to all of the local sites. See our Picture Gallery for pictures of these activities. During our 105° heat wave, we fled to the coast for three days. We now know that we are north-westerners. While it was sweltering here in Issaquah, on the coast it was in the 60’s, overcast and misty and we enjoyed every minute of it! We pray that 2010 will bless you with all the health and happiness that life can provide and that the Peace of Christ will be with you and those whom you love.